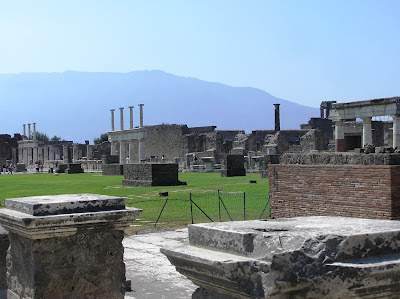 Pompeii (15 miles east of Naples and 130 miles south of Rome) was an affluent provincial town with some 20,000 inhabitants - and all of the usual temples, baths, theaters, government offices, houses and shops. It serviced a lush stretch of coastland between Mount Vesuvius and the Gulf of Naples, lined with the opulent summer residences of the Roman elite. The Palm Beach or the Newport or the Hamptons of Roman Italy...until 24 August 79 A.D. This fragile seaside paradise was not wiped off the face of the earth but buried far beneath it, under dozens of feet of volcanic ash. 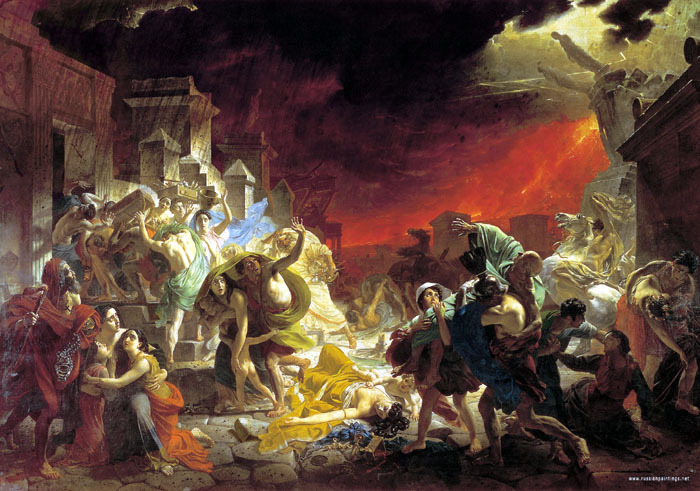 The inhabitants had already been killed - vaporized actually - by blasts of gas reach 250° C.
Pompeii and its neighbors Herculaneum and Stabiae disappeared from sight and then from mind - until 1738. Builders in the service of Carlo Borbone, King of Naples, then began turning up beautiful and intriguing if sometimes shocking remains from the rich volcanic soil of local gardens and vineyards. a rural family gathers late tomatoes. Excavations began ten years later in 1748, stripping away layer after layer of earth and ash. 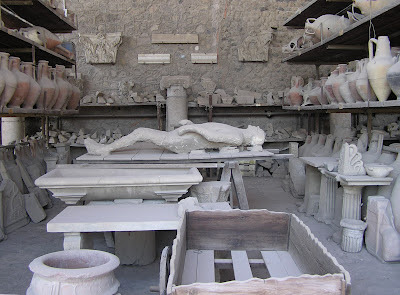 Revealing the intact urban fabric of Pompeii, as it was on the last day of its natural life. 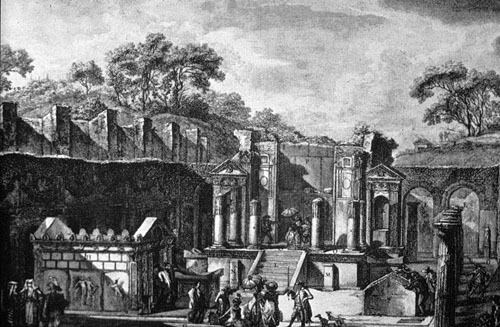 F. Piranesi, Temple of Isis at Pompeii (1788). For two hundred and fifty years, Pompeii has attracted a relentless stream of visitors - from the dilettanti of the Eighteenth Century, to the grand excursionists of the railway age to the mass trippers of today. 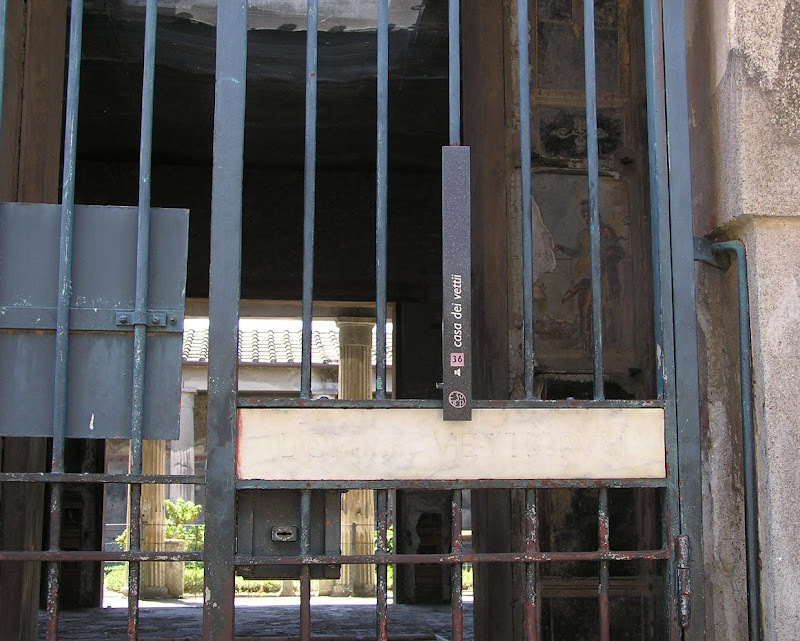 Two-and-half million tickets to the site are now sold annually to people from every country on earth. Pompeii is - quite simply - the most famous lost-and-found city in the world. But if we want a direct encounter with the Roman past, we are arriving a couple of centuries too late. L.-J. 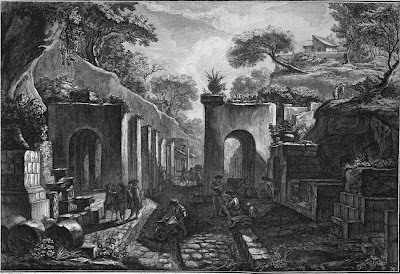 Despres, A Street in Pompeii (?1781). Pompeii has been excavated and restored countless times, then abandoned and neglected and restored again - with archeologists, curators, tourists and even vandals adding new layers of history and meaning. and Vesuvius still smoking in the background. 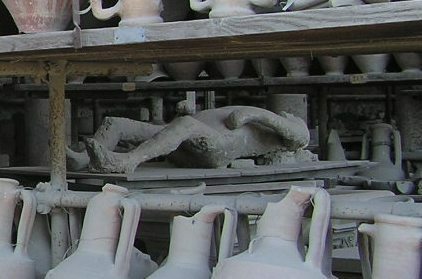 And curious visitors, almost any week, outnumber the cumulative total of Roman dead. 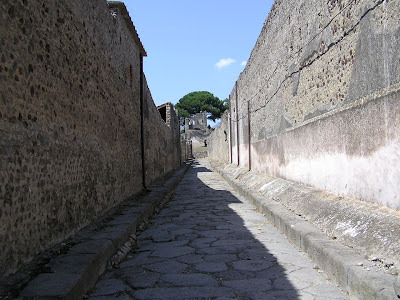 Another Pompeian street, seemingly lost in time. But still, there are sudden silences - even at the height of the summer season. 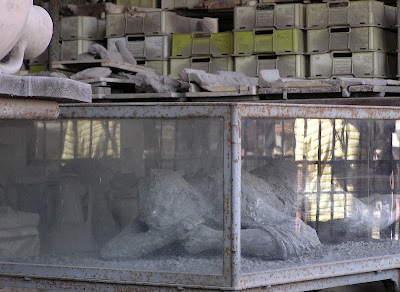 And unsettling encounters off the main tourist routes. note the frescoed figure to the right. Close-up of frescoed figure to the right. 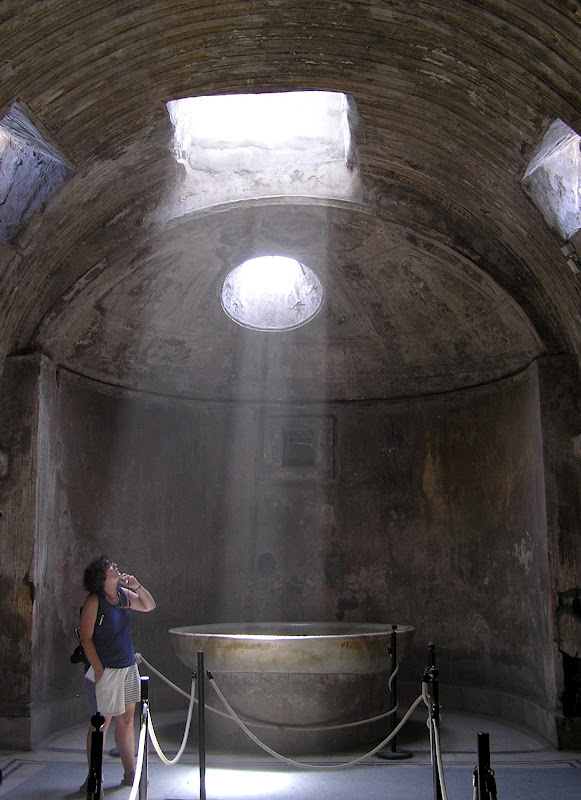 Light falls through an oculus in the bath. The most astonishing effects, however, were created long after 79 AD. 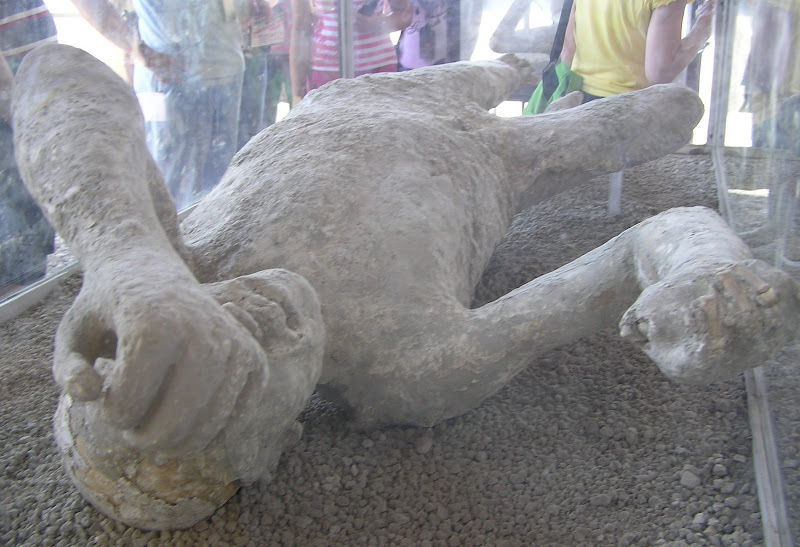 The inhabitants of Pompeii survived as negative corpses, their vaporized bodies preserved as air-pockets in hardened volcanic ash. 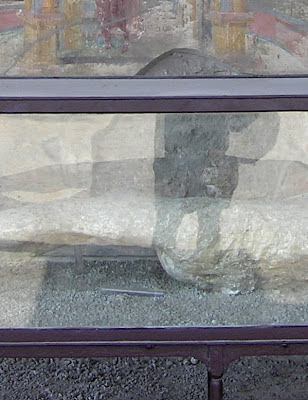 Giuseppe Fiorelli, an ingenious nineteenth-century archeologist, devised a simple but effective technique - injecting liquid plaster to refill the contours of their vanished forms. 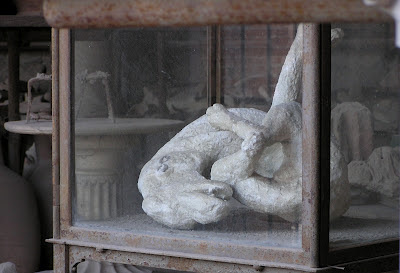 Body cast in a case. At every turn, we encounter the death throes of nameless beings at three degrees of separation: human body to hermetic vacuum to plaster cast. And now we can add two more: photograph to online publication. 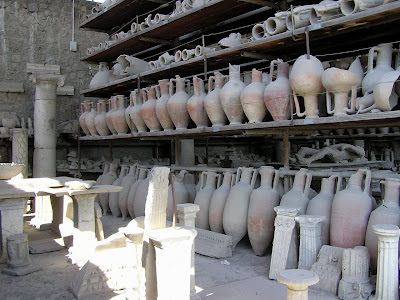 A storeroom in Pompeii; stuff and more stuff. Close-up of a body cast. 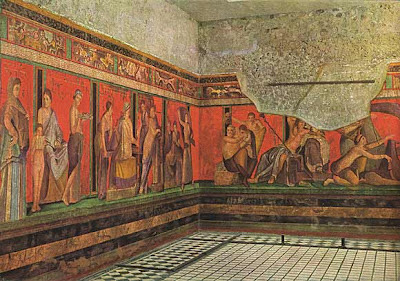 with frescoed scenes of cultic initiation. 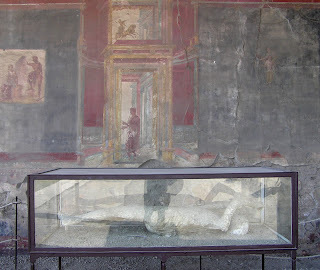 A glass case in the Villa of the Mysteries. Missing plaster? Reflection of the Photographer? 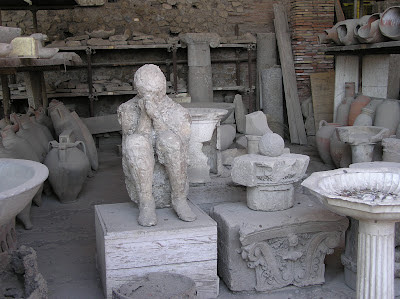 The Ghosts of Pompeii? 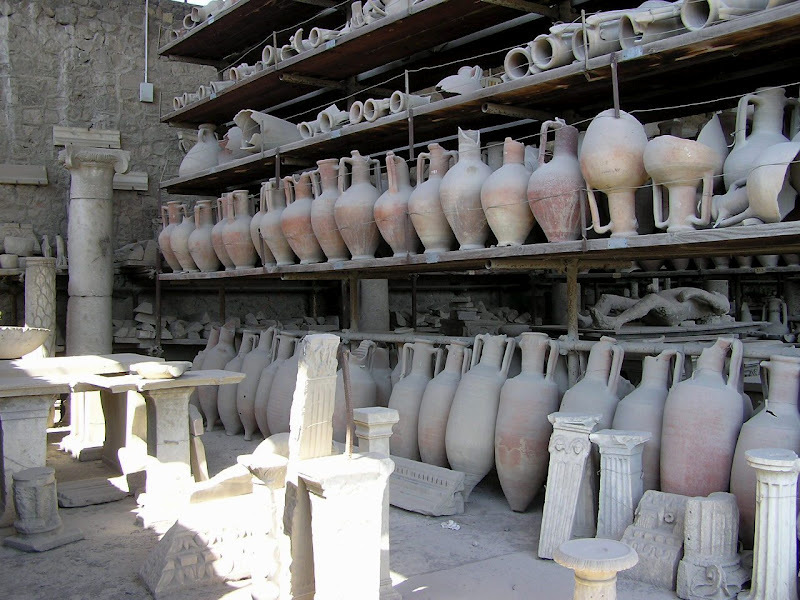 These are just a few... And 79 AD was only the beginning of their story, not the end. Brilliant photos.I always wanted to visit here.It was one of those places when I was younger that made me want to be an archaeologist (ended up an art student). Those body casts are chilling though, for simply the fact that they were people...great post. Thank you! Thanks, Sinead! I too think that my brother's photos are brilliant (even if he is looking over my shoulder as I write this. 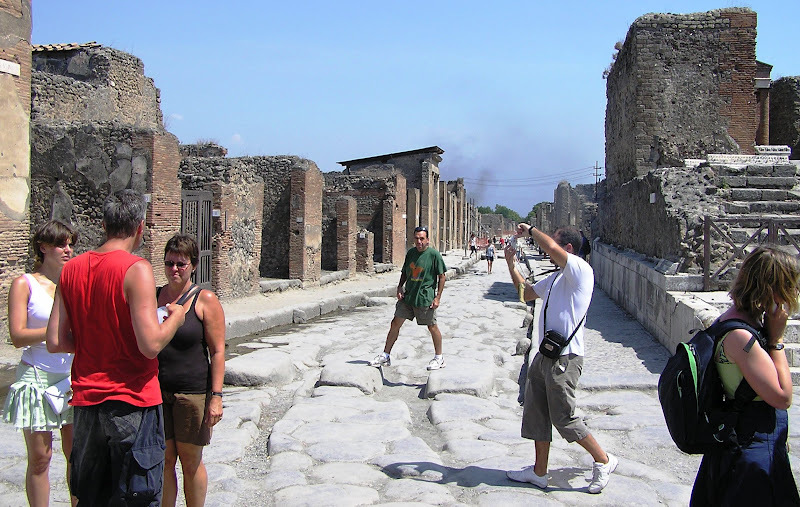 )By the way, Lyle Goldberg is the guy in the green tee-shirt striding over the crossing stones in the mid-ground of Photo Seven. I miscounted and thought he was the guy in the green and yellow tunic in photo ten. Thanks for the heads-up, Liv! I will keep a close eye on him in case he starts shopping for tunics. My grandmother always tells me how great the city of Pompeii is. As she keeps on telling stories about the place, I became more curious about it, that’s why I decided to visit the place all by myself since she’s on vacation at retirement community ny .